A tribal society is the one where people are organised into various tribes, sub-tribes and clans and the members of these tribal social tiers are closely knit and have a strong sense of allegiance to the tribe, its normative framework and values. Moreover, a tribal society also has a very elaborate social networking with other tribes. This evolves tribal solidarity which looks at everything foreign with suspicion and hence calls for limiting social contact with outsiders. This keeps status quo in a tribal society and makes social change extremely difficult in such a social setting. The Jaswant Singh episode is a difficult one for the ordinary Pakistani to get his or her head around. On the one hand there is pleasant surprise at the fact that an Indian, a member of a Hindu chauvinist party at that, has something positive to say about Jinnah. But then the very fact that Jaswant Singh is Indian (read: Hindu) means that any good Pakistani has to be suspicious about the intention behind writing the book. And besides, how on earth could he possibly claim that Jinnah never wanted a separate state? Policy differences between the two major political parties in Sindh exposed many core issues around which agreement is most difficult. While both the parties have hoards of reasons to support or reject the system of local governance, control of land is obviously one major issue. Whereas the powers to allot the land still vests in the office of chief minister, the existence of an elected tier of government with populist backup is not a desirable scenario for Sindh government. Sugarcane is one of the most important cash crops of Pakistan, especially NWFP. Linked with it is a viable industry comprising of 77 sugar mills — 41 in Punjab, 29 in Sindh and 7 in NWFP — producing refined sugar from sugarcane. Some portion of the crop is used for the production of gurr (brown sugar), especially in NWFP. Our natural forest mainly consists of conifer, broad-leaved trees often mixed with conifer species with high economic and ecological importance. The most important function of upland forests is the protection of watershed of the rivers system feeding the Indus valley, known as the "food basket" of Pakistan. The lowland areas of Pakistan are also dependent on the upper parts of the watershed areas for drinking water supply as well as the generation of hydroelectric power and prolonging the life of dams by curbing siltation. The ascension of President Barack Obama to the presidency was hailed as the watershed event in the history of US. Undoubtedly, in a larger sense it was. No quibbling with that. However, there was an underlying collective cynical voice, across the political spectrum, beneath this seemingly unsurpassable achievement that, however, big this achievement may sound, the tenor of black life is not going to change any time sooner, neither the matrix of historically unequal power relations between white and black in the US. Because of the increase in human population, there is an amplified biotic pressure on the available natural resources which poses serious threats to ecosystems and their biological entities at a large scale. These features of tribalism are also found in the society of Pakistan’s tribal areas known as Federally Administered Tribal Areas or as referred by the foreign writers the wild West of undivided India and subsequently of Pakistan. Unfortunately, this kind of a social structure exists today particularly at a time when societies everywhere are undergoing great transformation. Values of modernity are being observed all over the world through the process of globalisation, development and satellite and computer communication. In such a situation, it is very difficult for any society to evade change. However, the peculiarity of tribal society in Pakistani tribal areas is that it has been able to limit the social contact with outside societies and world. This has been done by making the territory so inhospitable and insecure by criminals and ultraconservative elements within the tribes and establishing linkages with criminal and anti-social mafia based in other areas. Most of the analysts and writers argue that it is basically the Pakhtoon values and norms that have kept tribal areas of Pakistan to maintain its archaic tribal structure. Arguably, this is only partly true if at all. The underlying cause is that inhabitants of FATA have resisted change or could not experience it is because of their remoteness, rugged mountainous terrain and topographic features of their land. The tribal areas also remained isolated and impervious to change largely because the Mughal, British and Pakistani rulers and strategists for their own vested interests had wanted them to be insulated from outside influences. Colonial sovereigns and Pakistani rulers respectively used and are still using the tribal territory to act as a buffer between empires and countries. Moreover, the strategic location of these tribal areas — as they not only straddle two countries Pakistan and Afghanistan but also lie at the crossroads of central and south Asia — has been responsible for their misfortune. A somewhat remarkable feature of the society of tribal areas of Pakistan is that instead of getting influenced from the societies surrounding it, in recent times, they have influenced the neighbouring people. Because the people in the lawless mainland Pakistan, of late, increasingly started looking towards the crude justice system of tribal areas with prompt deliverance as a model. This has so happened because the traditional jirga system under Taliban control has assumed the so-called religious colour. A large number of inhabitants of NWFP, Afghanistan, rural Punjab and Karachi have been influenced by the clerical tribal system and many even come there and have joined the ranks of Taliban. Unfortunately, tribal areas’ culture and social behaviour has impacted the surrounding people in more or less negative ways. Surely, one is talking in the context of exporting violent behaviour and intolerance towards civilized social structures and their cosmopolitanism and pluralism. The social conditions prevailing in Pakistani tribal areas indubitably provided an environment, if not a completely conducive one, for clerical radicalism of Taliban and Arab fundamentalism of Al Qaeda to come and thrive. This happened because an important aspect of society of FATA is the prevalence of strong ‘religious’ sentiments — like every tribal society where superstitious, conservative and narrow interpretation of religion is a norm. In fact, their only extensive social contact with outsiders in the recent past was when a large number of Al Qaeda and affiliated foreign outfits as well as Pakistani militant groups came and took up residence there besides using these areas as training and launching pad for their violent activities. This has struck slightly at the very roots of Pakhtoon tribal structure in FATA but instead of changing the local culture in the desired direction of development, these alien forces have exploited the tribal social structure and social conditions to strengthen themselves and further their agenda. This is no coincidence that certain radical forces like Taliban and Al Qaeda after being made to flee from Afghanistan, Arab and African lands got their strongest base in FATA. Obviously the prevailing social conditions and tribal structure facilitated this cause of foreign militants. Furthermore, the militant Pakhtoon tribal national character and its susceptibility to any dogmatic influence in the name of Islam played instrumental role in making Pakistani tribal areas hubs of clerical radicalism. 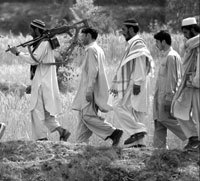 The radical Arab influence, directly through al-Qaeda and indirectly through tribesmen working in Gulf-Arab countries, reinforced the tribal structure in FATA but deprived it of the traditional Pakhtoon values of respect, altruism and an important standard of behaviour during conflicts of desisting from killing civilians or non-combatants. The purpose of this article is not to prove that tribal social structure in FATA is bad but that the inherent characteristics of such structure is incompatible with the ethos of modernity and urbanity. Tribalism in medieval times had a value to organise people in communities to facilitate their lives but it does not have any appeal for a civilised and enlightened man or community. After observing and personally experiencing the tribal life in FATA for years, this writer has come to the conclusion that the social structure in the surrounding societies of FATA and the world at large is radically different from that of tribal areas. Tribal areas are like an island in a mosaic of pluralistic and changing societies. Therefore, ultimately the tribal social structure, values and norms have to adapt to the world surrounding it rather than the other way round. The problem with a tribal society is that the decisions are taken collectively where the agreement of all or majority of a tribe or clan is not necessarily required. Rather the tribal chieftains or a coterie of influential persons make decisions and take actions on behalf of the tribe. Through this mechanism, the affairs of tribes have been managed since time immemorial. The negative aspect of this has been that every tribal individual has to suffer due to decisions taken by the tribal coterie. The example of Collective Responsibility clause of the Frontier Crimes Regulation, the legal order for FATA, is a case in point under which the whole tribe is held responsible and punishable for the acts of omission and commission of a few. After September 11 incidents in the US, alien elements whether foreigners or from other areas of Pakistan, in pursuit of their interests either separately or in concert, even eliminated hundreds of important tribal leaders and chieftains to highjack the tribal structure. The leadership of the tribe was forcibly undertaken by the militant clerics who started making decisions on behalf of the tribes. An important change thus took place in the tribal structure of FATA as militant clerics dictated their decision and imposed the same on the tribesmen by the force of superior arms and fighting strategies which they brought or imported from outside. But the existing tribal structure provided conducive conditions for the militant clerics to come and have sway in FATA. Yet another important change which the tribal structure has experienced under militant clerical commanders is that of an alliance among various tribal clerics. The Tehreek-e-Taliban Pakistan (TTP) has been its biggest manifestation. The backwardness of the tribal society with a large number of idle but potentially fighter youths greatly facilitated the religious extremists and militants by providing the latter ready and unquestioning support. Moreover, this is no secret that militant leaders like Baitullah Mahsud made various sub-tribes to contribute fighters by exploiting the condition there. For the tribal youth, clerical militancy called euphemistically by its perpetrators as ‘Jihad’ at least brings some change in the listless and routine tribal life. In short it is the apolitical, highly collective and superstition-based social structure of the tribal areas which is part of the problem of extremism and terrorism in Pakistan than part of its solution. Now after establishing that the tribal structure is part of the problem, the most pertinent question is how to transform it so that the process of development, which itself means a social change in the desired direction, could be initiated there. Moreover, how the tribal social edifice could be brought down so that the extremist tendencies and terrorist outfits there could be neutralised. (The writer is a PhD research scholar writing a thesis on countering extremism-terrorism in Pakistan. As much as Jaswant Singh has caused an uproar in right-wing circles in India, his book also illuminates the abiding nature of so many of our myths about the creation of this country, the history of communal politics in British India and Jinnah’s person. In particular I believe it is amazing how Jinnah continues to tower over the state of Pakistan, even though the majority of Pakistanis have almost no idea about his politics, his beliefs or his person. All too often one has heard the refrain that things would have been different in Pakistan had Jinnah lived for some years beyond 1948. In recent times numerous emails and SMS forwards detailing how Jinnah was scrupulous with public finances, condemned nepotism in all its forms, and was singularly concerned with the welfare of all Pakistanis, have been doing the rounds. And then every few months in a newspaper column or magazine or even TV discussion there is mention made of Jinnah’s speech in the Constituent Assembly on 11 August 1947 when he laid out his secular vision of the new state. Individuals do play a big role in history, but they are ultimately a part of it, not makers of it. To attribute to an individual much more importance in the way history played out than he or she could possibly exercise is actually the biggest injustice to be committed against present and future generations; exaggerating, or even distorting, the role of individuals necessarily serves an insidious purpose, and this could be no truer than in the case of Jinnah and the state of Pakistan. For too long academic debates have centred around the kind of state Jinnah wanted, or whether he wanted a state at all. What matters is that Jinnah invoked Islam as a political identity, and ultimately this fact has coloured the history of the subcontinent ever since. 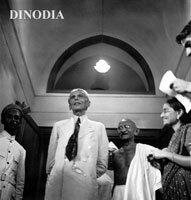 Of course Jinnah was not singularly responsible for creating a communal political idiom – ultimately it was the technologies of British colonial rule which produced various nationalisms, including that of the Muslim ashrafia. In fact Jinnah was simply the representative of a particular set of social forces at a specific historical conjuncture. In any case what one wants to assert is that whether or not Jinnah was committed to secularism in his heart is irrelevant because by opening up a space for the use of Islam in politics, he ceded the initiative to the anti-secularists. Jinnah helped create the Jamia’t-e-Ulema-e-Islam (JUI) as a breakaway faction of the pro-Congress Jamia;t-e-Ulema-e-Hind (JUH) led by Maulana Abul Kalam Azad. The JUI mullahs gave fatwas urging Muslims to announce their open support for Pakistan. Jinnah was fully aware that the slogan ‘Pakistan ka matlab kyat, La ilea ila’Allah’ was being popularised yet obviously felt that this was going to enhance his bargaining position vis a vis the Congress and the British. After having permitted the Islamisation of politics in this way, Jinnah could hardly expect that things could suddenly be reversed after partition. One does not believe that one can say things would have been different if he had lived. Having said this there can be no doubt that Jinnah personally was not at all enamoured by mullahs and was actually quite contemptuous of them. He was very liberal in his personal habits, and would never have presided over the state’s intervention into matters of personal conduct and morality. He married a Parsi himself (even though he later contradicted himself by disapproving of his daughter’s marriage to a Parsi) and generally viewed his Muslim identity as more of a political rather than a social label. It is good and well to recall these aspects of Jinnah’s person, but they do not represent a mandate to challenge the politicisation of religion: in this regard Jinnah played a pioneering role. Despite the fact that Jinnah equated being Muslim to being a nation, and even though he is often depicted as the leader of the subcontinent’s Muslims, he did not possess the ability to mobilise hundreds of thousands of Muslims at any point in time. He was more of a meticulous negotiator who squeezed himself into the echelons of power and then proceeded to eke out a share for his constituents – the Muslim ashrafia – rather than effect a comprehensive overhaul in the structures of economic and political power. 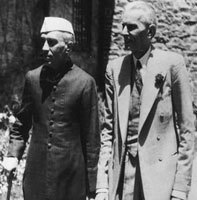 ]Jinnah did not confront the British in the manner that the Congress and other anti-colonial nationalists did at various points in time. In fact he was not at all in favour of confrontational tactics, preferring dialogue and other ‘legal’ means. A comparison of the culture of politics that was inherited by India and Pakistan indicates just how significant an inheritance is in shaping the future. Jaswant Singh’s inadvertent clash with the chauvinist ideologues who influence the shaping of India’s political and intellectual discourse is not really about whether Jinnah should bear blame for the partitioning of India, but about the license that politicians and thinkers have to challenge the orthodoxy of official history. Jaswant Singh is hardly an anti-establishment figure in India, so it is not as if his writing this book will rock the boat all that much, but the point is that, in India, some space does exist for orthodoxies to be challenged. One thinks that much more space exists in Pakistan for meaningful interrogation of state ideologies than many of us recognise. This interrogation is long overdue, and the point is not to apportion blame on one or the other larger-than-life individual who played a central role in the partitioning of India. Instead the point is to understand the multiple causes of historical developments whilst also correcting the myths that continue to hold us hostage. If we can recognize the complex factors that brought British rule to an end and the creation of two separate states, and thereby go beyond the tendency to reify individual actors, we might start to make sense of where we are and how to get somewhere else. Ironically, while eulogising the country’s founder as the Quaid-e-Azam or Great Leader, Pakistan has also censored him, sweeping aside his guiding principles, secularism and insistence on justice and constitutionalism. Similarly, in India Mahatma Gandhi is eulogised while his guiding principles and insistence on non-violence are made increasingly irrelevant. When the Nehru Report of 1928 (authored by Motilal Nehru) rejected this and other demands, Jinnah responded with his Fourteen Points of 1929, enunciating his conviction that Hindus and Muslims would eventually have to part ways politically if Indian Muslims were to obtain political representation. He turned to the idea of a separate state or states for Indian Muslims "within the Indian federation" — his vision right up to the months leading to Partition, according to Jalal. His demand for ‘Pakistan’ was basically a "bargaining counter" to gain leverage: he wanted to keep his options "open for a constitutional arrangement which would cover the whole of India" and steer a path between majority and minority while giving himself a role at the centre. The Muslim League’s famous resolution of Lahore, March 23, 1940, calling for the formation of Hindu and Muslim states in India as a condition of independence, makes no mention of ‘partition’ or ‘Pakistan’. This is because Jinnah’s vision for ‘Pakistan’ did not entail the partition of India, writes Jalal, but "its regeneration into an union where Pakistan and Hindustan would join to stand together proudly against the hostile world without. This was no clarion call of pan-Islam; this was not pitting Muslim India against Hindustan; rather it was a secular vision of a polity where there was real political choice and safeguards, the India of Jinnah’s dreams." This speech, meant to be his political will and testament according to his official biographer Hector Bolitho (Jinnah: Creator of Pakistan, John Murray, London, 1954), talks first about the inherited problems of the new country — the maintenance of law and order, with the State fully protecting "the life, property and religious beliefs of its subjects", the "curse" of bribery and corruption, the "monster" of black-marketing, and the "great evil" of nepotism. 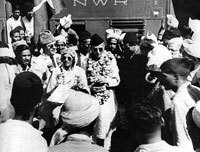 He then discusses the issue of Partition ("the only solution of India’s constitutional problem") — history would judge its merits or demerits but since it had happened, "we should wholly and solely concentrate on the well-being of the people, and especially of the masses and the poor." He urges the assembly members to "work in co-operation, forgetting the past, burying the hatchet…If you change your past and work together in a spirit that everyone of you, no matter to what community he belongs, no matter what relations he had with you in the past, no matter what is his colour, caste or creed, is first, second and last a citizen of this State with equal rights, privileges, and obligations, there will be no end to the progress you will make. "Therefore, we must learn a lesson from this. You are free; you are free to go to your temples, you are free to go to your mosques or to any other place or worship in this State of Pakistan. You may belong to any religion or caste or creed that has nothing to do with the business of the State... We are starting with this fundamental principle that we are all citizens and equal citizens of one State.... Now I think we should keep that in front of us as our ideal and you will find that in course of time Hindus would cease to be Hindus and Muslims would cease to be Muslims, not in the religious sense, because that is the personal faith of each individual, but in the political sense as citizens of the State." The issues he outlined still haunt India and Pakistan today. His successors were quick to reject his vision. 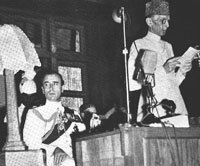 After Jinnah’s death on September 11, 1948, the assembly commissioned a new national anthem, consigning Jaganath Azad’s lyrics to history. Jinnah’s speech of Aug 11 was literally censored "by hidden hands", as Zamir Niazi, the late chronicler of media freedoms details in his book ‘Press in Chains’ (Karachi Press Club, 1986). And a month after his death, his successors passed the Safety Act Ordinance of 1948, providing for detention without trial — that Jinnah had in March angrily dismissed as a "black law". 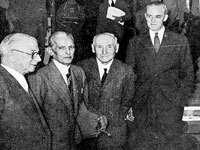 It is inconceivable that Jinnah would have agreed to the ‘Objectives Resolution’ that the Constituent Assembly passed in March 1949, laying the basis for formally recognising Pakistan as a state based on an ideology. It is interesting to note that the past regime had repealed Sindh Disposal of Urban Lands Ordinance (SDULO) 2002 in a bid to remove any legal check on the absolute power pertinent to transaction of land. This government does not seem interested in re-enacting this statute, which was meant to institutionalise transparency in land distribution procedures. And since land is one of the most precious resources that are fiercely contested between political and other interest groups, a legal or administrative procedural check on its transactions is not on the cards. Pressure on land is building up from various quadrants. The various international lending agencies have adopted a market-based approach towards land transactions. The World Bank has been stressing upon the various government departments to auction off the land assets either to retire existing debts or improve the financial positions in the overall respect. This amounts to the distribution of land in a nascent manner without long or short term planning prescriptions. In many cases, the lands could not be planned or properly ascertained. Such adhocism gave rise to unscientific prioritisation of land for sales and development. If the present regime would have desired, it could have used the provisions of SDULO 2002 for constituting an efficient and transparent land management mechanism. For example, the contents of the repealed law made it essential to document the land as a pre-requisite for disposal. This automatically implied the survey and re-survey of land parcels, authentication of previously executed surveys and addition of updated information. The government also possessed the opportunity to establish the reserve prices of land parcels especially the commercial and industrial categories. The transaction of amenity plots, which is normally done through personalised contacts of certain individuals/organisations with decision makers, was also to be streamlined. The law entitled the provincial government to prepare and notify rules and regulation for the routine functioning of the land owning and managing agencies. The previous or present government followed none of these useful prescriptions. Supply of land cannot be infinitely stretched, as it is a finite resource. Sindh, had considerable reserves of state land which later fell within the limits of urban areas. Historically, this land which was considered as an asset and was carefully utilised for residential, commercial, agricultural, recreational, industrial and other purposes, at least in the large cities, changed considerably. Instead of an asset, it was viewed as a tradable commodity. This gave rise to evolution of a land market which was entirely uncontrolled, discretionary and haywire in nature. Nascent market forces determined the utilisation and transaction of land compared to rational public choices. Without realising the social, ecological and even long-term economic consequences, the sales and transaction of land has continued unabated. Political interest has been one of the prime factors that determined the procedure of land supply. This interest superseded the urban and regional planning considerations, objectives and policies of the administration, fiscal liabilities and even legal limitations. Whereas the upper tiers of government were largely involved in this process, the chief ministers of various governments played the key role in land allotment due to the infinite authority vested in the office as well as the political clout. Bypassing the laws, regulations and norms thus became a routine exercise which did not let any land supply mechanism to function. In brief, land parcels were allotted due to political pressure from the influentials/party workers and bullies of various kinds. Political bribes were also given in the form of land. The announcement and cancellation of housing schemes was done on the same basis. Government departments, law enforcing agencies, financial institutions and urban development authorities simply became a carrier of orders in that working set-up. Land disposal schemes mostly developed as a clandestine marriage of convenience rather than a transparent and equal opportunity enterprise. The attempts made in this respect have been severely criticised by the users, media and analysis. The Defence Housing Authority has announced a large real estate scheme along northeastern corridor of Karachi which is now open to all. This institution which was originally created to cater to housing need of deserving officers of the armed forces, has now transformed itself into a leading realtor in the sector. It is feared that possibilities of real urban poor to acquire land for housing will be further jeopardised due to ever shrinking land reserves. The existing pattern of land ownership has a direct bearing on its transaction in the urban scenario. The clan influences, appropriation and possession of land were the important factors that governed the directions of development. When land was in private ownership under traditional landlords, they lobbied with the public sector officials to devise the development policies/priorities to maximise their own benefit. Planning and development of communication schemes, transportation projects and investment in infrastructure schemes were largely manipulated on the same basis. The fringes of large cities are the most important choices in this regard. The northwestern outskirts of Karachi is one of the main locations where local landlords have traditionally benefited from the growth of the city. A visible disparity between the privileged and non-privileged classes is apparent in land transactions. As mentioned earlier, land was procured, developed and sold through the priorities and conditions laid down by the public sector agencies in liaison with the powerful interest groups. These groups attempted to maximise their respective profits by moulding the decision-making in their own favour. Land supply was one such prerogative. Thus the unprivileged had to fend for themselves in the informal locations as per availability of land. Many negative repercussions have developed in the course. The inner city ring of Karachi between 0-10 kilometres radius has most of the upper income groups residing in the area. Squatters and low-income localities are far away making the poor to commute long distances to their places of work in dilapidated transport systems at high costs. The distinction between formal and informal sector is swiftly diminishing due to the incapability of the formal sector to control the overall factors that affect land market. The concepts and implementation mechanisms of the public sector have begun accepting the existence of informal sector operations to a considerable extent. This is evident from the fact that evictions of informal settlements have been taken after cautions and the government regularizes them in the usual working norms. De-facto ownership of land is now given due regard in the development operations and is often temporarily recognized. The direct transaction of raw land from the Board of Revenue to the user groups is another citation in this respect where the conventional watertight authority is not extended towards such activities. The authority of land distribution needs to be decentralised so as to incorporate the local priorities to an optimum extent. Karachi Strategic Development Plan 2020 must be articulated to evolve workable guidelines for land management procedures. Urban sprawl should be stemmed to minimise the costs of infrastructure and transportation. Besides, the construction and development bylaws of the respective localities have to be adjusted according to the sociology and economics of the settlers. The present regime, which claims to be the representative of the people, must mull over the promulgation of a suitable law for institutionalising land disposal and management. Manufacturing plants were provided to sugar mills in NWFP in the 1960s for the manufacture of sugar from sugar beet grown in the province. This greatly helped in the sugar production of the country, besides generating income for the growers in the province. However, the production of sugar beet crop has stopped since 2009 due to non-distribution of sugar beet seeds by the sugar mills. This has resulted in lesser sugar production during 2009. Sugarcane is a long duration crop as compared to other cash crops grown in the country. It requires great skill and huge investment in the form of inputs on the part of farmers to grow this labour-intensive and cost-oriented crop. The farmers are faced with myriad problems in the form of increase in cost of production, high labour rates, water rates, etc. At the end of the day, however, the farmers are at the mercy of sugar mills, unable to even get the cost of production of the crop to make ends meet. Reportedly, during July-March 2008-09, sugar production declined by 26 percent compared to 34 percent of last year — the major reason being the confrontation between sugar mills and farmers over the sugarcane price. The support price of sugarcane has remained a point of contention between sugar mills and the farmers for years. The resultant sugarcane shortage due to confrontation between sugar mills and farmers has badly affected consumer and other industries. According to press reports, Pakistan’s 2009-10 sugar production is expected around 3 millions tonne as against 3.2 million tons in the last year. 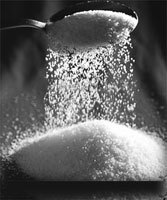 The country’s annual sugar consumption fluctuates between 3.6 to 4.2 million tonne. Industry’s officials, on the contrary, say it has gone down since October because of higher prices and economic recession that has resulted in lower demand from industries such as drink producers. According to farmers associations, the area under sugarcane cultivation has gone down slightly, but they are expecting better yield because of the better varieties of seeds. The current sugar crisis is similar to that of 1968 crisis which resulted in crippling of the then government. The government should, therefore, formulate a realistic long-term sugar policy in consultation with all the stake holders to safeguard the interests of both the farmers and sugar millers and provide them a level playing field. Also, revival of sugar beet cultivation in NWFP will greatly help in production of more sugar and improving financial position of the farmers of the province. In northern parts of our country, the natural coniferous forest is depleting at a fast rate for fuel, timber purposes and their natural ecosystem is converting into agricultural production lands. As a result the development of the country especially their bio-resources are under severe threat. It is worth mentioning that Pakistan as a whole has 5 percent of its area under forest cover and it is too meager to satisfy timber and fuel wood needs of growing population of the country. At present, Pakistan imports wood and wooden products mostly pulp paper. To attain self-sufficiency in fuel wood, and other wood products, the forest department has introduced Eucalyptus into both the plain and mountainous areas and also into both waterlog and arid/dry regions of the Pakistan. Due to limited knowledge about Eucalyptus Spp some of the foresters and ecologists of the country believe that it is an ecologically hazardous tree. I would like to clarify the stand of Eucalyptus Spp for the monsoon plantation and coming spring season plantation. It is an undeniable fact that eucalyptus plantations have played and will play a tremendous role in alleviating the fuel and construction material problems of the community. Since 1960, world-wide eucalyptus planting has doubled every decade. In 1990 the total area in hectares planted by eucalyptus was 1.5 million. In spite of this, quite a number of people express their reaction against eucalyptus planting. Some foresters and ecologist believe that a lot of these arguments are unfair, biased, nationalistic or emotional and most of these arguments are unjustified and could also be applied to some tree species such as Gravillea robusta and Jugulans regia which have allelopathic effect on most agricultural crops. It is, therefore, worthwhile discussing some of the arguments to have a better understanding. One of the main misconceptions about eucalyptus is regarding its water consumption. There are quite a number of research results which revealed that eucalyptus is an efficient water user. For instance, two species of Eucalyptus saligna and E. grandis could produce 46.6 m3/ha/yr without drawing on water reserves(rainfall only) compared to 16.4, 16, 12.4 m3/ha/yr biomass production for the coniferous, acacia and other broadleaf species, respectively. These figures reveal that for the same amount of water consumed eucalyptus produce higher amount of biomass which is economically profitable and acceptable. Most eucalyptus species need on average 785 liters of water/kg of biomass produced as opposed to cotton/banana(3200), sunflower(2400), field pea(2000), cow pea(1667) soya bean(1430), potato(1000), sorghum(1000) and maize(1000) liters/kg biomass produced. These figures show that eucalyptus species are efficient water users. There are two main ways to conserve soil. These are physical and biological conservation measures. Construction of check dams and bench terraces can be mentioned as some of the physical measures of soil conservation while planting tree species is a biological measure. Planting of any kind of tree species in the form of a monoculture should not be taken as the best solution to sheet or surface erosion. In mountainous area, especially the sites which are vulnerable to erosion, eucalyptus stands should be established at wider spacing particularly on gentle slop sites. Wider spacing has an advantage to let the penetration of sun rays to the forest floor which is one of the many prerequisites necessary for undergrowth development. The presence of undergrowth minimises the surface runoff and in this case eucalyptus stands have the potential to favour the natural regeneration of Indigofera Spp, Croton Spp and several medicinal plants species. The depth of the accumulated letter in the forests is usually to be on average of 20-30 cm. Although eucalyptus generally produces less annual litter fall (1800kg/ha/yr) compared, for example, with Albizea lebbeck, 5000kg/ha/yr, if all litter were not totally collected by people for fuel, it would have been incorporated into the soil system to slow down runoff and improve infiltration. As a result of litter collection the ground is left bare and exposed to soil erosion. This misconception has incorrectly attributed to the allelopathy. It is a difficult task to model soil/plant nutrient cycling in any forest type. This is mainly because there are a number of environmental factors influencing nutrient replenishment from parent materials as a result of weathering. Not only that the rate of leaching is also very difficult to quantify in natural ecosystems as the system is not closed and controllable. The nutrient consumption of fast growing species like eucalyptus species need to be well studied before wrong conclusion and recommendation is being made. As fast growing species, it seems logical and sensible if the species consumes and drains nutrient from the soil. In short, eucalyptus planting is not harmful both in ecological and financial terms. In a country like in Pakistan where the mountain dwellers have no other energy alternatives and where about 80 percent of the annually produced wood is used for fuel, it is totally unacceptable to oppose eucalyptus planting. Most of the rural and urban dwellers also depend on eucalyptus planting for the production of construction poles. Eucalyptus flowers produce nectar for honeybees especially species like E. citrodora and also used for perfume and oil production. Out of 600 different eucalyptus species, 20 species are widely planted virtually in all sites and ecological zones of Pakistan. In some parts of the country, eucalyptus became the main stay of the community for additional income generation. Eucalyptus species are tolerant to severe periodic moisture stress, low soil fertility and fire and insect attack. These comparative advantages of the species made it part of the life of the rural people. The sad fact is that little is known about their growth, yield, soil nutrient/plant interaction, water consumption and management. Foresters and ecologists are challenged and confronted with such problems which they should solve in order to fill the knowledge gap and come up with more indigenous species pool for reforestation and aforestation purposes. Until such time, however, eucalyptus seems to be planted widely in the country particularly in waterlog sites. In conclusion, it seems that there are no profound reasons not to continue or discourage eucalyptus planting in Pakistan. The latest illustration of this cynical group came on the July 16 when a prominent African American intellectual, and a Harvard University professor, Henry Louis Gates, found that not much had changed for them in US. When Gates returned to his home in Harvard from an overseas trip, Cambridge police on suspicion of breaking in house-arrested him. The chain of events leading up to the arrest of Gates by Cambridge police panned out like. On his return from China, while struggling to get into the house due to faulty lock, one white passer lady told the police of a possible break in by two black men (Gates and his cab driver). Cambridge police led by sergeant Cowely arrested Gates after some heated arguments. He was handcuffed and clapped up in prison for few hours. Within minutes the news of Professor Gates’ arrest was on the airwaves, sparking a heated debate on the treatment of the blacks by the US law enforcement agencies. In his first reaction President Obama termed the action of Cambridge police as stupid in arresting Professor Gates once they had established that he was in his own house. Obama also termed this incident as a ‘teachable moment’. However, soon afterwards, Barrack Obama reversed himself under pressure from the Cambridge police by saying his choice of words in calling the action of police as stupid was unfortunate. While saying the incident arose of overreaction from both, he invited both parties to White House to smooth the matter. This might solve the tension between the two individuals involved, but the incident goes to the heart of how black have been treated historically in the US penal system. Professor Gates put it down to stereotyping in the law enforcement department. Soon the debate ballooned to how black and non-white are treated in criminal justice system of US. The debate, though long-running without resolution, was reignited once again by this incident. This made every black and non-white in the US say that if this can happen to someone like Professor Gates then the outlook for ordinary non-white is pretty grim. It is well established now that black and Hispanics are over-represented in the US criminal justice system. Despite advances made by Afro-American in the wake of US civil rights movement in terms of outlawing segregation and putting in place affirmative action, criminal justice system has dealt a raw deal to black in the US. From stop and search operation by the police to several disproportionately high black population, there runs a single thread of maltreatment of black in the US. (In the post 9/11 period the ratio of Muslims in prison has gone up as a result of national-security driven arrests and detentions). More pertinently, in recent years we have seen blatant misuse of police powers in relation to blacks. The case of Rodney King is alive in recent memory. In 1991, white officers severally beat Rodney King, a black motorist. The video footage of the incident on the airwave caused worldwide outrage at the brutal tactics of police against Afro-Americans. The next year, LA erupted into days of rioting when the news of police officers involved in beating Rodney King were cleared by the judiciary. A similar incident occurred in Philadelphia where a black man Thomas Jones was badly beaten by the police officers. Not surprisingly, 2002 was to witness yet another repeat of institutionally racist mindset of law enforcing agencies when police officer, Jeremy Morse, was caught on camera brutally beating a black teenager, Jason Donovan in Los Angeles. Jackson’s case triggered memories of the 1991 beating of Rodney King, showing no lessons were learnt and operation of law enforcing agencies was still suffused with discrimination when it came to blacks (it is important to note that complaint was already pending against Jeremy Morse, for beating up another black earlier on). There is a deep embedded history of Gates-like event recurring throughout US history. Though many advances have been made in inconsequence of US civil rights, negative construction of black in relation to law and order has remained a stumbling block in the realisation of equal rights for blacks. I suspect there is a possibility of Gates affair fading away soon, without using this rare opportunity to raise a debate on race and class in the US today. The long-term test of Barrack Obama soaring rhetoric on every thing on the earth lies in how he addresses historic disadvantage that blacks have suffered in the US from slavery days to the present day. Inviting Sg Cowley and Professor Gates to white house for private reconciliation would hardly amount to addressing the issues that arose of ‘teachable movement’ that Obama spoke off poetically. Global warming and climate change is now considered as one of the leading threats with likely cross-spectral, broad, and profound implications and consequences on prime productivity, socio-economic sectors, health, agriculture, forestry, fisheries, water regime, energy consumption, natural processes, and ecosystems thereby affecting mankind and disrupting nature’s equilibrium. Climate change will add additional pressure on the natural resources leading to resource and land degradation. The trend of climate change will manifest in the form of species extinction, change in the pattern of crops, droughts, floods, storms, tornadoes, and other kinds of natural calamities. The response of vegetation and biological entities is one of the most reliable sources of determining the extent and impact of climate change over a period of time. The link between the environment and poverty is also a factor for contributing to the climate change. Besides reducing climate change effects and biodiversity conservation, the role of forest ecosystems in providing means of livelihoods can not be overlooked. One billion people that live in extreme poverty depend on forest resources as a source of revenue and deforestation currently accounts for 25 percent of all greenhouse gases around the world. Sustainable forest management, however, is one of the key factors in maintaining the socio-economic and ecological services of the forest ecosystem. Geographically, mountains covering about 20 percent of the earth feed water to major rivers in the world. Because of their altitudinal characteristics, they readily respond to global warming and climate change which consequently affect associated flora and fauna at a larger scale. Thus, deforestation in the Himalayas has not only exposed mountain slopes and made them vulnerable to erosion but has also caused sedimentation of reservoirs. Pakistan’s economy and environmental profile is largely being affected by high population growth, unfriendly environmental practices, deforestation, pollution, depleting biodiversity, desertification, habitat fragmentation, over-exploitation of natural resources beyond capacity, receding glacial phenomena, water scarcity, expansion of urbanisation, degrading fragile ecosystems, inefficient energy use etc. These factors are also likely to increase Pakistan’s vulnerability to climate change. Severe pressure on resources of the country will adversely affect food production which will consequently affect the livelihood of millions of people. The climate change will affect water regimes, water reserves and pattern of rainfall their affects on vegetation and crops will be profound both in rain-fed conditions and the tropical zone in the country because of scarce water. In 1999 and 2000 the drought caused sharp decline in water tables and dried up wetlands, severely degrading ecosystems. Fresh water might become a scarce resource in the future. Freshwater wetlands or peatlands are accumulations of decomposed organic matter that have an ability to store water, reduce floodwater peaks and provide water during dry periods. Projected increase in evapotranspiration and increased rainfall variability are likely to have negative impacts on the viability of peatlands, resulting in dessication and shrinkage. The main source of water in Pakistan is the Indus River system. The Indus River irrigation network forms one of the world’s largest contiguous irrigation systems having associated ecosystems. This serves as a source of livelihood for million of people, whether it is forest dependent communities in the north, poor farmers and fishermen in the Indus plains or fishing communities in the Indus delta ecosystem. Changes in water flow will degrade spawning streams. The gradual glacier recession in the Himalayas is projected to increase flooding within the next two to three decades followed by decreased river flows up to 30 percent to 40 percent over a period of five decades. This will dramatically cause fluctuations in irrigation water with increased sedimentation from the upstream. Increased temperature and decreased precipitation would register sever impacts on water availability for crops with decreased crop productivity and increased handling and combating cost. Mangroves constitute a significant part of coastal biodiversity. Besides continuous loss of mangrove forests, the sea-level rise due to global warming and climate change will cause salt-water inflows which will tender profound damage to the mangroves and their rich fish breeding habitats. This will have deep repercussions on the associated flora and fauna. Marine ecosystems would also come under threat of coral bleaching, increased invasive species, and ocean acidification. In addition to the livestock sector, the agriculture sector will largely suffer from the impacts of climate change in Pakistan. According to an estimate of the Food and Agriculture Organization (FAO), agriculture currently accounts for 24 percent of world output and uses 40 percent of land area. The cereal crops - rice, wheat and maize - make up 85 percent of world cereal exports and are thought to be particularly sensitive to climate change. Because of water scarcity and heat stress agriculture in Pakistan is highly exposed to the effects of climate change that will affect agricultural productivity. There is likelihood that the cotton belt will shrink and shift further north to cooler regions. The changed climatic scenario would affect planting time, crop rotations with focus on new cropping patterns and heat resistant crop varieties. With decrease in rainfall by 6 percent, net irrigation requirements would increase by 29 percent. Reports indicate that the decline in irrigated wheat yield in semi-arid areas of Pakistan is expected to be in the range of 9 to 30 percent for temperature increases of 1 to 4 degree Celsius. Global warming would have an impact on growing season of plants and agriculture crops. There will be shortened growing season length for wheat (wheat -rice, and wheat-cotton, wheat-sugarcane systems). Dry land areas in arid and semi-arid regions are most vulnerable to climate changes that would put the country’s food security on a troubled threshold. Because of the diversity in topography, soil type, and climatic conditions Pakistan supports a wide variety of flora. However, due to biotic pressure the natural forests of the country are subjected to agricultural expansion, and other consumptive uses such as fuel wood extraction, fodder collection, grazing of livestock, and timber. Given these parametres of social and economic nature, the climate change scenario would further render heavy impacts to the forest products and services and important tree species such as deodar and fir would suffer great loss. With increase in temperature and changes in weather graziers would move towards higher altitude grazing grounds and pastures for grazing of their livestock in summer. This would not only cause depredation of livestock by predators but competition for food would be more among livestock and wildlife species. Further, the reports indicate global warming has caused shifting of vegetation zones to higher elevations with significant threats to biodiversity and ecosystems. Studies suggest that with future global warming large forest areas in northern mountain areas of Pakistan would shift from one biome to another. Conifers of cold and temperate zone would show a northward shift, pushing against the cold conifer/mixed woodland. Weedy species having ecological tolerance will have an advantage over others. High-elevation tree species such as Fir, Acer, and Betula prevail in cold climates because of their adaptations to chilling winters. Increase in temperature would not only result in competition between such species and new arrivals but will also reduce resilience of natural ecosystems and force migration of species through fragmented habitat. Flora and fauna having restricted ranges or distribution will also face increased threat of survival due to further shrinking of forests and pastures, while changes in precipitation will alter their structure. Climate change will favour some invasive alien species in different geographical zones of the country. Increased temperature will have large scale effects on productivity, regeneration success, plant growth, plant distribution, photosynthetic rates, decomposition rates, incidence of fires, pest outbreaks, diseases, and rate of mortality. There is a great need to expand vegetation zone or green belts within the metropolitan cities and towns that would not only help maintain moderation in local or microclimate but it would also help provide green spaces for recreation and relaxation within the closed city environment. That the climate change is an economic, developmental, and environmental problem, there is a strong need for concerted efforts to adopt comprehensive adaptation strategies to mitigate climate change and overcome environmental problems with a long term approach.